is compatible with your BMW. simply give us your VIN number. Contact us and tell us your VIN and we'll let you know your options or point you in the right direction. INSTALLATION DIY with no wire-cutting. Vehicle coding is required and included. DIY with no wire-cutting. Vehicle coding is not required (Plug and Play). Your BMW needs iDrive with Navigation Professional and the Park Distance Control (PDC) system for it to take advantage of all of this kit's features. Our cameras can also be installed in certain MINIs. To confirm compatibility with your vehicle, please contact us with your VIN. Add on options such as Side- and Top-view to the Rear-view Camera to give your car full Surround View. Contact us for pricing! It's truly plug-and-play installation but also requires coding, which BimmerTech provides via remote session activation. Estimated installation time: 3-4h. Click here to read more about installation process or see the clip. The retrofit kit includes all parts required to add a rear view camera to your BMW. Installation in a BMW is 100% reversible, perfect for leased vehicles. Mounting the camera module on a MINI requires cutting a small hole in the rear bumper. For more information about installing our MMI camera in your MINI, contact us. This rear-view camera retrofit kit is a BimmerTech exclusive and uses your BMW's factory iDrive screen and camera mode, so you get the same look and feel as a factory-installed cam, with nearly the same picture quality at a much lower price. A value-priced option which also uses the native BMW camera mode. Your BMW needs iDrive with Navigation Professional, but does not require Park Distance Control. Add on Park Distance Control sensors or, for even greater security, a Front Camera to protect your car from collisions with objects that are close to the ground. Contact us for pricing! Installation is truly plug-and-play but does involve coding, either via USB or performed remotely by a BimmerTech technician, depending on the model. Estimated installation time: 3-4h. Click here to read more about the installation process or see a clip. This kit does not use the native BMW camera mode. Instead, the rear view camera display will override your iDrive screen when you put your car in reverse. This kit gives you the best of both worlds: OEM-like functionality plus installation ease, more helpful features such as on-screen parking lines, and lots of options, including the ability to connect a video player - all this at about the same price as the BimmerTech OEM Integration Kit. All you need is a factory screen - this camera is compatible with every model equipped with a factory screen. Add on a Front Camera ($199) to protect your car from collisions with objects that are close to the ground (click here to see the view from the camera), SmartView ($250), allowing you to connect your phone wirelessly to your iDrive screen for hands-free navigation, viewing pictures and videos as well as playing games or movies, or VividScreen ($200) for E6x/E9x fitted with a CCC iDrive system and F3x with the smaller 6-inch display, adding compatibility with our latest upgrades and features. Click here to check the requirements. It's truly plug-and-play and doesn't require coding or remote activation like OEM models do. Note: if you have a manual transmission installation requires tapping into the reverse light wire. Estimated installation time: 3-4h. Click here to read more about installation process or see the clip. Click here to compare SmartView HD Flex with SmartView HD. Compatible with MMI Rear View Camera. If you have other camera, please contact us for pricing. Please verify that your smart device uses Airplay (iOS devices such as iPhone, iPad, iPod touch, etc.) or Miracast (available in Android and other devices) wireless technology standards, which are compatible with the SmartView HD Flex device. Some applications and content do not support mirroring. Instead the MusicTV app can be used. SmartView HD Flex device should be plugged into the AUX port, located either in the armrest or, if your vehicie is supported, in the multimedia interface harness. SmartView HD was designed, engineered and built for Apple users and enables you to: watch Netflix, Hulu, HBO, Disney and more, view live sports, news, and weather, seamlessly stream music and movies on your iDrive screen, use your favorite apps, check email, surf the web and even use popular navigation apps, such as Waze and Google Maps, all on your factory iDrive screen! The SmartView HD utilizes Apple TV 3 and ensures zero delay and high definition video. To check compatibility with your vehicle, simply go to the buy now section, enter your VIN and check the add-ons for the MMI Rear View Camera. *Price of the SmartView HD in the package deal with the MMI Rear View Camera (Multimedia Interface HD upgrade included!). 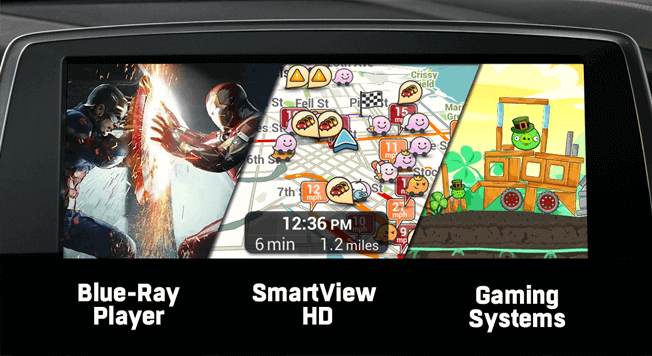 SmartView HD should be plugged into the AUX port, located either in the armrest or, if your vehicle is supported, in the multimedia interface harness. Please note that Apple has ceased production of the Apple TV 3. We will continue to provide SmartView HD using refurbished Apple devices. As refurbished stock, this hardware may show some aesthetic wear, but will still be covered by our warranty as part of the SmartView HD kit. Visibility isn't just about what is behind you. Whether you are parking or driving, total security also means avoiding hard-to-see objects in front of your vehicle. Even minor collisions cost time and money and can also inflict serious damage on your BMW. The wide-angle, high-quality lens provides a detailed and full-color image and corrects perspective - even at night when visibility decreases. With the front view camera, you'll never have to worry about what's ahead! Compatible with MMI Rear View Camera. If you have other camera, please contact us for compatibility and pricing. Make the most of your camera with an 8.8″ 1280×480 drop-in replacement for the factory iDrive display. Available for 3-series E9x and F3x, 4-series F3x and 5-series E6x fitted with the smaller 6″ or lower resolution 8.8″ screen. In E-series vehicles, VividScreen adds compatibility with advanced features that had only previously been available to vehicles fitted with a newer generation iDrive system, such as dynamic parking lines and our SmartView HD. Fits perfectly into the dashboard for factory-like appearance and functionality. In certain vehicles, we offer coding to ensure the displayed image is not stretched. Contact us for more information. Click here to compare VividScreen with Factory Screen. The all new Multimedia Interface HD takes your car to the next level by delivering high definition picture resolutions, advanced settings for automatic activation of your Front View Camera, SmartView HD support, iDrive controller compatibility and more! (Click here to read more). The Multimedia Interface HD also features 2 HDMI inputs and an additional RCA video input to connect additional devices such as Blu-Ray players, DVD players and even gaming systems! Click here to compare Multimedia Interface with Multimedia Interface HD. *Multimedia Interface HD is included for free as long as it’s compatible with your BMW model. Please note that although the Rear View Camera delivers excellent picture quality, as demonstrated in our product spotlight videos, it utilizes an RCA port and is not in true HD. However, any devices connected through the 2 HDMI ports will remain in high definition. The video presents Dynamic Parking Lines in MMI Rear View Camera. This is one of the Rear view camera's top features. Dynamic Parking Lines move with the steering wheel to indicate your path and help you avoid obstructions and back-up and park safely. Dynamic Parking Lines is part of the standard package for the OEM Rear View Camera. For OEM-Integration and MMI Rear View Camera, this feature is free of charge for BMWs with CIC and NBT iDrives. Unfortunately, for BMWs with CCC iDrive, dynamic parking lines are not supported and only Static Parking Lines are available. *Dynamic Parking Lines are included for free as long as they are compatible with your BMW model. BimmerTech Trim Tool Kit is a must-have for any self-respecting DIYer. 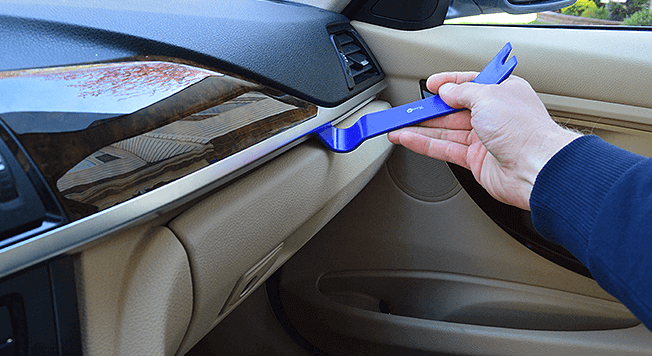 These four professional grade tools, designed to remove door panels, molding and interior trim, are made of high-quality plastic that resists wear and tear and guarantees long-lasting performance. They offer leverage not damage - these tools won't break or scratch non-metal trim surfaces. The set is sold in a compact bag for handy storage. Disconnect the negative car battery terminal. If you are installing the OEM Integration Rear View Camera, you should have your car coded before you start the installation, either via USB for compatible models, or by a BimmerTech technician through the internet (click here to see how to schedule your coding session). To install the rear view camera in the trunk handle: begin by removing the trim panel on the trunk lid. Before you put the car back together, make sure the camera works. I highly recommend the units sold by Patryk at Bimmertech. I installed both the front and rear camera in my 2011 335is and both work flawlessly. More importantly, during the install I had several questions and Patryk responded quickly and with helpful responses (important when you're dashboard has been dismantled and you want to complete the project over a single weekend!). I also highly recommend the backup camera with dynamic parking lines from BimmerTech. I installed this on my 2011 328i xdrive. Patryk responded quickly to all my emails. He even remotely did the coding even when the camera was not installed. He also sent me complete installation instructions specific to my car model. It is the best retrofit camera. Even BMW would not have done a better job. Superb night view as well. Very easy to install. Plug and play. Everything you need is included. Everything is well thought out. I installed my Bimmer-Tech plug-and-play rear camera retrofit kit this weekend (2015 F80). (...) Like others have said I am really impressed with the quality of the camera and trunk-lid opener (rubber-coated plastic just like OEM), OEM integration (no splicing is nice), and great image quality (surprised by the field of view provided by the camera). It just works, really well. I just finished installing the backup camera (...) with Patryk of BimmerTech. It was made so much easier by the expert advice and patience demonstrated by Patryk. This was the first major retrofit I have attempted, and had price quotes from $450+, but a long weekend was all it took. I would not hesitate to recommend their products (which are first class), nor their customer assistance, which was A++. The camera version I got required coding, which went through hassle free; they do it remotely so all you have to do is sit back and relax, it took 10-15 mins. I chose the option for dynamic parking lines, and I would highly recommend getting this option. Comes in handy when you are backing up in a tight spot. The camera is really good, very clear picture quality even at night time (low light). (...) If any of you folks are trying to decide upon a rear cam, do consider Bimmertech. 1. Comparing rear view cameras: which one is the best for my BMW? If your BMW is equipped with Navigation Professional and parking sensors, we recommend the OEM integration camera because it uses the factory camera mode (like a factory installed camera). It will integrate the camera view and parking sensors view on the iDrive screen just like the original BMW camera. Although the OEM integration camera kit includes aftermarket parts, it will give you the OEM look and feel for around half the price of the OEM kit. If your BMW does not have parking sensors, we believe that the MMI rear view camera kit might be a better option than the OEM integration kit, but this is purely a matter of personal preference. With the OEM integration kit you will be using the factory camera mode, which will show the parking sensors view on the right hand side of the screen even if your car does not have parking sensors. This means you will always see a picture of the car on the right hand side of the screen but the parking sensors radar will not work. With the MMI kit, the camera picture will be displayed on the entire screen. OEM integration and MMI kits use the same camera lens, so picture quality is equally great in both cases. The MMI camera can be expanded with front camera or smartphone screen mirroring (SmartView HD Flex), while the OEM integration does not support these add-ons. Overall, we think that the OEM integration camera kit is better value for money considering the price difference between the two kits. 2. Is the installation very difficult? I'm worried that I won't be able to do it. The installation of the rear view camera kit is not difficult for a relatively experienced DIYer. Visit our installation chapter to read more about the installation process or check the map of installers who can perform the installation for you locally. 3. Are there any installers in my area? How much does installation cost? You can check our installers map here. Costs differ depending on the installer; call directly to ask about pricing. 4. How does Remote Coding work? What do I need to have my car coded? We will send you a coding interface. This is a cable that plugs into your laptop and the OBD port in the car. The OBD port is located under the dashboard on the driver side and can be easily accessed without removing any parts. In order to schedule your coding session, click here and follow these instructions. During your coding session, our technician will ask you to run desktop sharing software on your laptop so he can configure your laptop. After a few minutes, you will be asked to connect your laptop to the car with the coding interface. The coding session usually takes around 20-30 minutes. After coding is complete, you can remove the software from your laptop. What's required to prepare for a coding session? 5. How does USB Coding work? We will e-mail you a coding file within two working days of receiving your payment. All you need to do is save it to a USB memory stick, put the stick in the USB port in your vehicle’s armrest and wait 60 seconds. It really is as easy as that! 6. Which models can have OEM-Integration camera coding done via USB? USB coding works with head units CIC, CICR and NBT. 7. My BMW has a PDC; will it work if I install a camera? Yes, it will. Presentation of the PDC will depend on the camera type. 8. Does my BMW need a PDC to make a rear view camera work? No, it doesn't. Only the OEM Rear View Camera requires the PDC. You can purchase the OEM-Integration or MMI Rear View Camera and they will both work without PDC. 9. I have the OEM rear view camera; can I add a Front Camera? You can probably add a front camera to your BMW. However, you will need to purchase Multimedia Interface. Please contact us and provide your VIN number. We will check if it will work for you. 10. Where can I find the installation instructions? You will receive the installation instructions after you receive your kit. In the package you will find short instructions on how to request and receive the installation manual from us via e-mail. We care about the environment so we don't include printed manuals in the package. 11. Will these cameras work in my MINI? BMW and MINI are registered trademarks of Bayerische Motoren Werke AG. BimmerTech is not affiliated with BMW AG in any way, and is not authorized by BMW AG to act as an official distributor or representative. The availability of BMW and MINI original products on this website should not be taken to imply that BimmerTech is endorsed by BMW AG or its associates. We now feature an additional option that automatically activates your Front View Camera when switching from reverse to drive. To activate, simply choose your desired activation timeframe in the iDrive menu, then set it and forget it. Seamless and automatic. Also new, is the ability to access the Multimedia Interface HD's menu system by using the iDrive controller, instead of having a separate remote control. For SmartView HD Flex: Please verify that your smart device uses Airplay (iOS devices such as iPhone, iPad, iPod touch, etc.) or Miracast (available in Samsung Android devices) wireless technology standards, which are compatible with the SmartView HD Flex device. Some applications running on iOS devices like YouTube or Netflix do not support mirroring. Instead the MusicTV app can be used. For SmartView HD: To enjoy all of the features of the SmartView HD, we require an iOS or Android device with hotspot functionality. To check compatibility with your vehicle, simply go to the buy now section, enter your VIN and check the add-ons section for the MMI Rear View Camera. *480p for E-Series BMWs or F01/F02/F10/F11/F25 vehicles with CIC iDrive. These vehicles will receive a non-HDMI version of SmartView HD Flex. Size 6" or 8,8" 8,8"